Wow, I had an amazing time at FloydFest this past weekend—tons of friends and lovely strangers dancing their hearts out to everything from old school bluegrass to the Punch Brothers to Matisyahu. The weather held out for us and it didn’t rain the entire time I was there (G got a little soaked on Friday afternoon)—seriously so much fun camping and drinking and wandering about the festival grounds. Oh, and the food wasn’t half bad either! But today is SSFC and guess what I’m featuring! (That’s right—zucchini.) It’s growing out my ears, you guys, and I’m really hoping that I never get tired of it. Zucchini stir-fry with some eggplant, corn, and soy curls is on the menu tonight (with a jarred green curry sauce. I’m totally not above that, btw.) and I’ve got to wrassle up some more zucchini pasta or fritters or maybe zucchini falafel tomorrow (can I make a zucchini falafel…hmm…latkes at least). Next year I’m planting one zucchini plant. Maybe. We’ll see. This zucchini, though, is on the sweeter side of life—zucchini bread. Can you believe that I’ve never made zucchini bread before? I made these patty pan muffins the other year, but no zukes were involved in the baking of those. So I figured, why not, let’s go with a retro recipe, but with a berry twist: Zucchini Blackberry Bread. In a large mixing bowl, combine the flax eggs, melted Earth Balance, almond milk, vanilla, sugar, and molasses. Stir to mix well. Add the flours, baking soda, baking powder, salt, and spices and stir to combine. Stir in the shredded zucchini. Next add the blackberries and gently stir in. Spray a 9×5 loaf pan with spray oil and pour the batter in. Let cool for 15 minutes and then enjoy! I love zucchini bread! And, wow…yours is by far the prettiest I’ve ever seen. Floyd Fest sounds wonderful…I definitely want to go someday. What a beautiful loaf! I know the feeling…bombarded by zucchini. I am running out of ways to use it. Thanks for this great recipe! 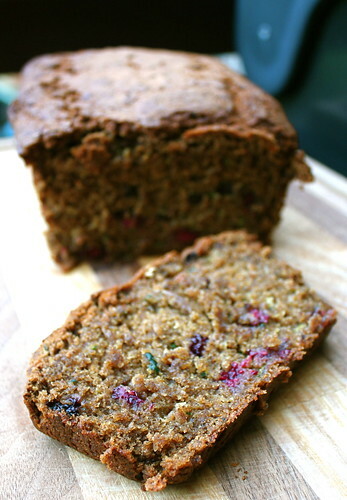 Blackberries in zucchini bread, you say? Now that is something I’ve never thought about at all. Of course now I’m a little distracted by the thought of delicious soft bread with berry bursts! oh my gosh that bread looks outrageous! i love blackberries! Wow, such an inspired combination! The bread looks fantastic. I swore I would never grow zucchinis again after sowing 8 plants years ago and being so inundated with zucchinis. We became so tired of eating them even though I was pretty creative with how I was using them, zucchini koftas were our favourite recipe by a mile. I’m so jealous of your zucchini. I got exactly one from my garden. Some critter ate the others and then I think the plant just decided to quit. Very sad. I love zucchini. Ah, too much zucchini is a “problem” I’d sure love to have. I nay just have to pretend and stock up on way too many of the summer squashes at the farmer’s market. Very curious about those falafel, by the way. Would love to hear how that goes! 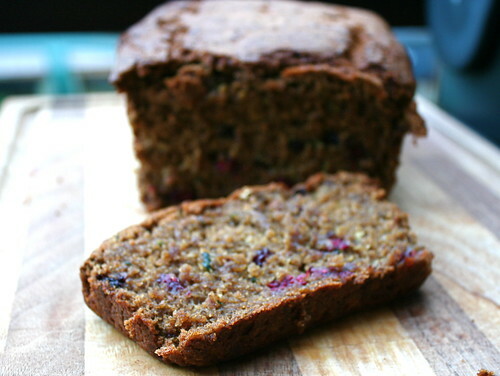 Your zucchini blackberry bread looks like a party in a loaf – it’s so festive! Zucchini bread might be the very first thing I ever baked or cooked on my own, when I was a kid (my mother doesn’t have the black thumb I do, so I grew up around excesses of zucchini) but I haven’t made it in years. I just might have to be nostalgic and give this a try. I could not find Buckwheat flour today! Think I could just use 3 cups all-purpose?